Familiar with the history associated with the development of the field of nano science. • Familiar with the key technological advances which facilitated the advancement of the field. 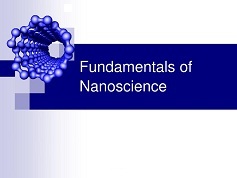 • Understand the underlying reasons for the unique properties associated with nano materials. • Understand the current and potential applications of these materials in the various areas of biomedicine, biotechnology, materials science, electronics, photonics, agriculture, energy production, enhanced catalysis, biosensors and micro fluidics. • Familiar with the instrumentation and technologies currently utilized to manipulate and fabricate a variety of nano materials currently in use or under investigation.